On the one hand, I rejoice today because as far as child sponsorship goes, 56 children have been sponsored, meaning we only have 6 profiles left posted right now over at HelpKorah.com. (We're working on getting more posted!) So, this is GREAT news! If you can sponsor 1 of the 6, click HERE. "The street life is very challenging and miserable especially for a woman who has young daughters. Formerly, I used to live on the street because I had no other options to survive," explained Almaz. 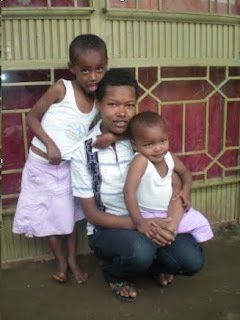 "I am from Arba Minch, which is about 550 km far from Addis Ababa, the capital city of Ethiopia. I used to live in the small village around Arba Minch. I had a great desire to help my parents and myself. While I was in this mind, I met a woman that can find a job for me in Addis Ababa. Her name is --------. She promised to give me a job in Addis Ababa. After a while, I decided to come with her and work in Addis Ababa. Unfortunately, she did not have the capacity to find a job for me even; she lives in the very crowded house with in an uncomfortable situation. That situation made me to search a job and work for survival. I lived with her for two years by working small activities to generate income for my own expense. At that time, ----- introduced me with Dawit. After a while, I gave my first baby from Dawit in 2005.I got a daughter and her name is Kalkidan. In Addis Ababa, there is a trend to increase the price of the house rent, if the family size is increased. Because of this, the price of the house rent was increased and I could not be able to pay the house rent. So I obliged to live on the street. It was very hard to me to begin life on the street with my baby. it was the only option to live, and thus street become my home. In order to prevent the wind, the sun, and the rain, I made a shelter on the street beside the fence of somebody’s compound. Even if, I made a plastic shelter, I always feel cold when the weather turned into colder especially, at the nighttime. Moreover, I had faced different challenges in different time. In order to make life easy, it was a must to work during the day time but the street boys and girls come and took the night cloths and the materials that I used to cook the food. There was also a problem in the nighttime. The street men come to me in order to satisfy their desire and mate me forcefully. For this reason, I started to live with some other street women. Unintentionally, I became pregnant and gave birth to Meron in 2008. At that time, I could not work anything because I had to look after for my daughters. So I decided to beg the people who walk on the street to get money for food. When I was living in this situation, one day five ladies came to my shelter and told me as they wanted to help me. I agreed with them and they took me the house where they rented for me. Now I am so happy because I have no fear whether it is dry season or rainy season. The weather does not make me think a lot. They promised to me as they will cover my room expense until I become self-sufficient. In addition, they told me to contact Transformation Love ministry in order to get further support in physically, socially and spiritually. Currently, Kalkidan is 5 years old and Meron is 2 ½ years old. I did not get a sponsor who can cover my daughter’s school and food expense." Again, if you can help, please, use the contact form HERE and get in touch with us as soon as you can.